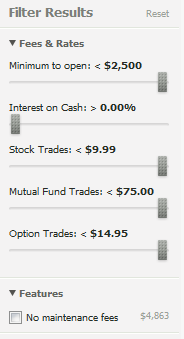 If you are currently using online brokers for your investment trading and for finding out great stock funds, there’s a new service under Mint.com which you can start using today that will help you to find out the best brokerage. We all understand that there’re many online brokers to choose from and most of them look and even speak the same. But, in fact, there’s differences in terms of the fees and commissions that are being charged. And if you do take all these into considerations, they can affect your overall investment rate of return. So, to help you save on fees and commissions, Mint.com has actually introduced a Brokerage Search Service that will help you to find out the best brokerage firm based on your online trading activity and your current brokerage account. The first few sections help you to understand your trading habits and most importantly – the fees and commissions. If you have been trading without knowing all these figures, it’s actually time to call up your brokerage firms for the numbers. Once you have them, you can input them into the boxes. To start searching and to narrow down your searches, you can choose to filter the results based on some of the factors shown on the screen. The next step to take will be to estimate your savings that you can have and you also get to see the total savings that you can get over time frame like 1, 2 or 3 years. And once you have all these on the search page, Mint.com will give you a list of recommended brokerage firms that best fit your trading activities and also at the same time the amount of savings that you can get with them while you continue to invest or stay invested. If you have not checked out this service from Mint.com and you are a regular investor, do so today and start saving on your fees and commissions!